Ventilators bring fresh air into your home without losing heating or cooling energy. Their unique energy exchange system transfers the heating or cooling energy from the stale air being exhausted from your home to the fresh air the ventilator brings into your home. If your family suffers from allergies, ventilators are a much better alternative for introducing fresh air into your home versus opening your windows. They also do a great job of reducing cooking and pet odors, smoke and other pollutants out of your home. 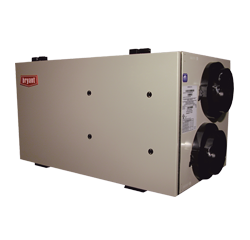 Internal air intake - draws in stale indoor air, directing it through the heat exchanger core. External air intake - draws outside air, venting it through the air filter. Internal air exhaust - vents indoor air outside from the heat exchanger core. Up to 84% of the indoor heat has been removed, helping minimize utility costs. Fresh air exhaust - vents conditioned, heated outdoor air into your living areas. High efficiency heat recovery core - extracts heat from stale indoor air and transfers it to fresh outdoor air for maximum comfort with little heat loss. This core also removes excess humidity from recirculated air - lower humidity levels help you stay comfortable at higher temperatures in the summer and lower temperatures in the winter. Ventilator motor - moves air through the system efficiently and quietly. Air filter - cleans outdoor air of small particles before they circulate through your home. Electronic circuit board - adjusts air circulation modes and motor speeds. Damper defrost - helps prevent frost from forming within the system, eliminating the need for a supplemental energy -consuming electric defroster. This defroster engages when temperatures drop below 23 degrees Fahrenheit. Briefcase-style exterior latches - allow easy filter changes with no tools required. Simple wall control - makes operating the HRV easy and convenient.